I need some help... Can someone point me in the direction of a thread or youtube video of someone actually replacing the rear calipers on the Dart? I dont want to see a before and after, I want to see the whole process. @alpinegreenneon while yes that is the case but i take it from someone looking for a how to on replacing the calipers, i have a hunch that rebuilding them isn't yet in their wheelhouse. Plus i typed in dodge dart rear caliper replacement on youtube and got plenty of hits. I actually just replaced my rear rotors a week ago. I found a few videos, including this one , but I couldn't find any that fully matched or showed the entire process. A couple of tips that for you though. -The star tool(if that's what yours has) is a size 8. -Removing the outer portion of the caliper separately(leaving the inner portion connected) is the easiest and best way of doing it. This allows you to remove the hand brake. -Removing the hand brake wasn't obvious to me, so a tip on that. Push on the two tabs within the bracket and twist the cable, that holds the tabs. Then push the brake lever and pull the cable out. Then simply twist the caliper and pull the cable through the cable holder. -When putting it back together. I put one side of the springs into the pads, then slightly slid the outer caliper over them. This held the pads in place while I had popped the other side of the spring into the second pad. It took a few tries, but it worked. Just thought I'd add a photo. They turned out nice. Mass_Paul and Parabolaralus like this. Looks great. What type of paint did you use? 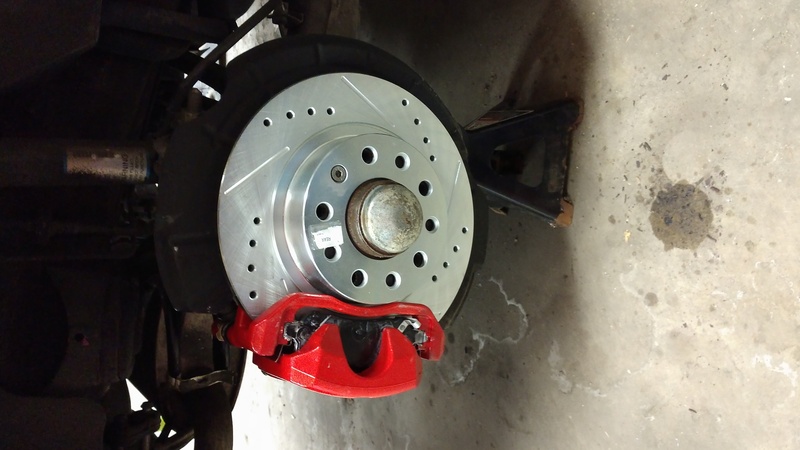 I didn't actually paint the calipers and don't know what type of paint is used, other than they are powder coated in red. I bought a full set from Callahan on Amazon for a pretty reasonable price. The pads and rotors are from Power Stop, and those I purchased on Amazon as well. How funny! I had seen the same calipers on Rockauto the other day and was kind of wondering how the fair up, but no posts regarding them on here. So i must ask what are you impressions of these calipers so far? Do they feel about the same as OEM, better or worse? I don't think the calipers have made much difference outside aesthetics. As far as I know, the calipers are re-manufactured OEM calipers that have been painted. I do, however, have a noticeable difference in braking from the new rotors and pads. I have only replaced the rear so far, so I'm really looking forward to seeing the difference when I replace the front.